To kick off the project, my teammates and I gathered information about CentUp's competitors to understand what the market was like. The client had given us their market and user research which gave us insight into their key users. With that information, we created personas to help us frame the goals the users will achieve on the mobile app. In addition to the personas, we were able to derive three main design principles: simple, usable, and feasible. Keeping in mind the personas that we were designing for, we created user journeys to details the exact steps the user goes through when interacting with the app. The workflow showed the required interactions and paths through the system and helped us figured out how the elements of the app would flow together. 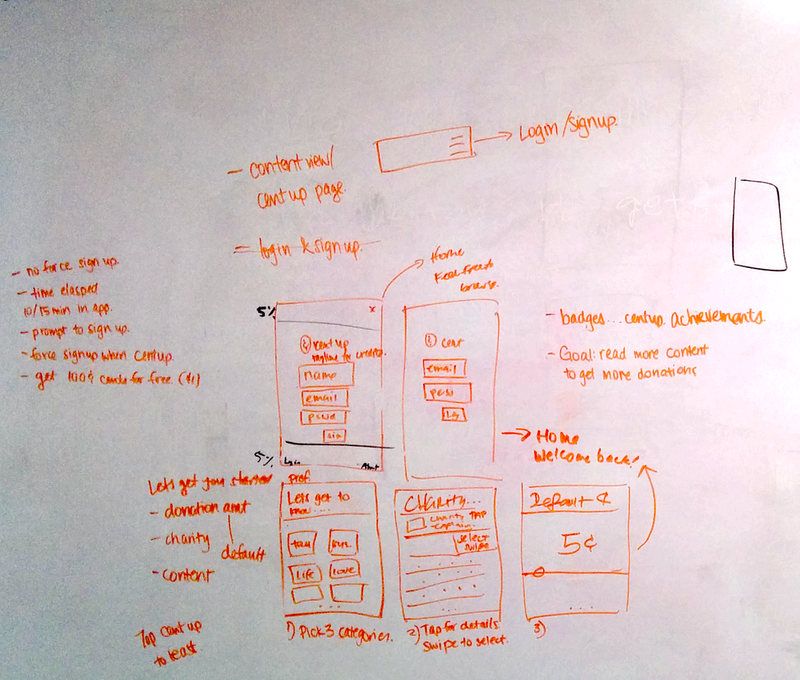 Given that there was a quick deadline on the project, the team decided on sketching out lo-fi wireframes via whiteboard. These wireframes helped us determine the content requirements, the page layout, the navigation between screens, and the overall app functionality. The wireframes we created help to answer the question: how does the app look, feel, and work? Incorporating the hierarchy and layout determined in the wireframes, I designed each of the screen pages (shown above) in Illustrator and Photoshop. I kept our design principles, the client’s brand guidelines, and the users’ needs in mind. The next step was to show how the screens interacted with one another in a prototype. I led the prototyping for the final app and leveraged InvisionApp to do so. The prototypes highlight the interactions featured in the app and allowed the client to see a glimpse of the functionality the app would provide prior to development. The InvisionApp link can be found here. OUTCOME: Our team ultimately responded to the RFP with a final presentation and prototype of the application. Our designs were aimed at creating a minimum viable product that could easily and quickly be deployed based on their ask. As a result, we also included recommendations for future iterations. Certain aspects of our designs and functionality were chosen to be implemented in the first iteration of their iOS app.